firewall or from the PVC valve from a junk after PS car may be able to be used. 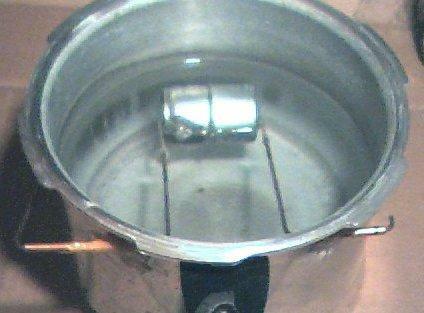 The grommet used for the safety valve in the pressure cooker may be able to be used. By the way I found the new step drill bits to be quite usefully in drilling the hole in the lid of the pressure cooker and when needed in the side near the bottom for supply 5 gallon buckets. 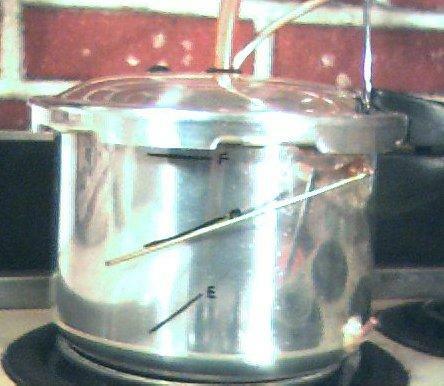 A float was used to measure water level inside the pressure cooker. See example below. It was made out of a large inline disposable gas filter with the ends cut off and soldered up to make it air tight. 3/32 Brass brazing rod was used for the float hinge mechanism. Any other type of wire would also have worked including coat hanger wire. Small copper pipe about 3/16 inch was used for the outer hinge and was epoxied to the aluminum pot by use of copper epoxy. The copper epoxy is designed to replace solder and is sold at home improvement stores like Home Depot. 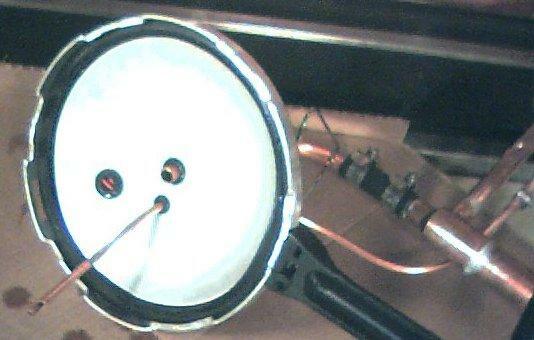 The ½ inch pipe that comes out of the top of the pressure cooker and the inside pipe of the heat exchanger needs to be just big enough in diameter so as to not build up a back pressure in the cooker. Bigger pots and hotter fires may need a bigger pipe or more than one heat exchanger may be needed.. Occasionally the pressure cooker will need to be shutdown and the contents empted out to dispose of the salts that build up. The frequency will depend on the dissolved mineral content of the water. Water taste: Using the copper coil approach the output had a strong vinyl hose taste. Using the last approach with the heat exchanger and the hot water dropped through open air to remove hydrocarbons before entering the boiler chamber resulted in very little taste.